Dr. Harbuksh Sekhon is a 2003 graduate of the University of Manitoba Dental School. He decided to become a dentist after receiving his graduate degree in Immunology. Dentistry has become not just his career, but his passion. Dr. Sekhon completes up to 300 hours of continuing education a year in a wide range of services like dental implantology, periodontics, and orthodontics. Dr. Harbuksh is a general dentist. For more complex cases, we often refer our patients to a specialist for treatment. Aside from private practice dentistry, Dr. Sekhon works with lawyers in the insurance industry to investigate oral health conditions related to incidents like automobile accidents. 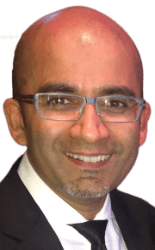 As a family dental provider, Dr. Sekhon says his goal is to diagnose conditions effectively, treat his patients well, and the rest will just fall into place. He has a sincere passion for preventive dental care and to limit the amount of restorative dentistry that his patients need over time. He does this through offering procedures like advanced oral cancer screening, in-house braces and laser dentistry. Dr. Sekhon has donated many hours of professional services to the Pure North S’Energy Foundation – providing dental care and wellness services to individuals with compromised health conditions. Although he is a member at the local golf club, Dr. Sekhon has only golfed a handful of times. He prefers spending time outdoors with his wife and their dog!